Motorists traveling east on Irving Street at the intersection of Georgia Avenue were greeted with a new welcome sign yesterday afternoon. This was the result of years of hard work and perseverance from the residents that live along the 400-600 blocks of Irving Street, NW. 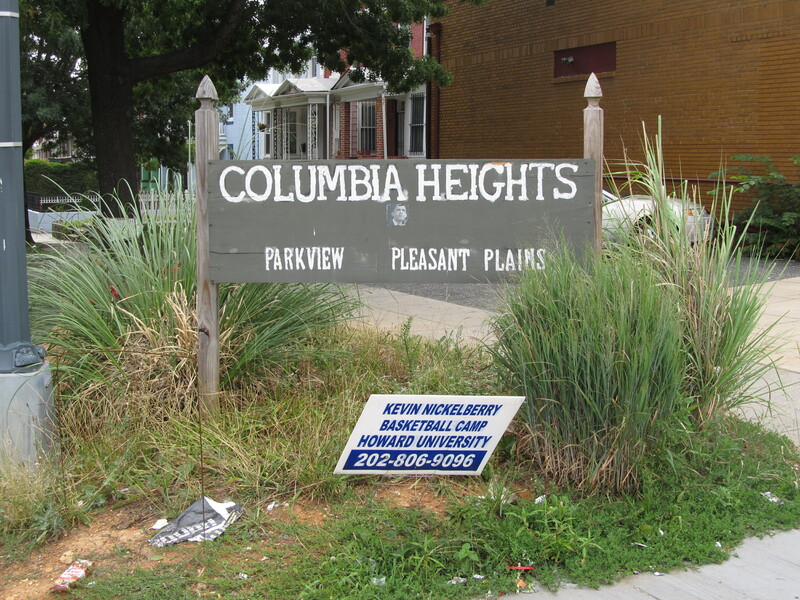 The new sign, and the soon-to-be-installed landscaping, were also made possible through funding from the Columbia Heights Shaw Family Collaborative and the American soft drink beverage companies. 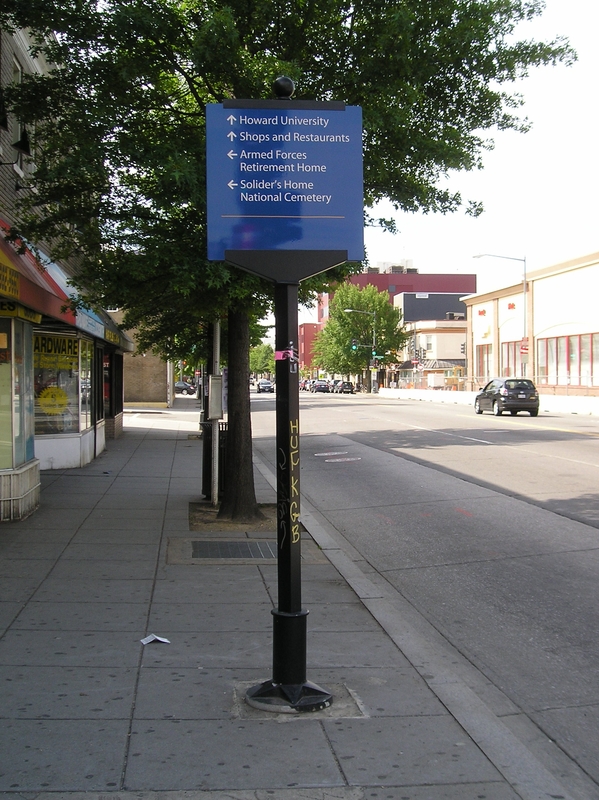 The process to replace the old sign was first brought before ANC 1A in June 2011, but due to confusion on neighborhood borders and identities it did not receive ANC approval until September 2011. 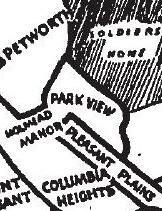 This confusion was caused both by the inclusion of Columbia Heights, Park View, and Pleasant Plains on the previous sign as well as the District’s muddling of neighborhood names in their various databases (The District takes no official position on neighborhood names and borders, even though they frequently use such names in their documents). It is a testament to the dedication of the Irving Street community to have seen this project through. The new sign is a true asset to the streetscape and something for everyone in the neighborhood to be proud of. To all that made this sign a reality — Well Done! What a difference a week makes. 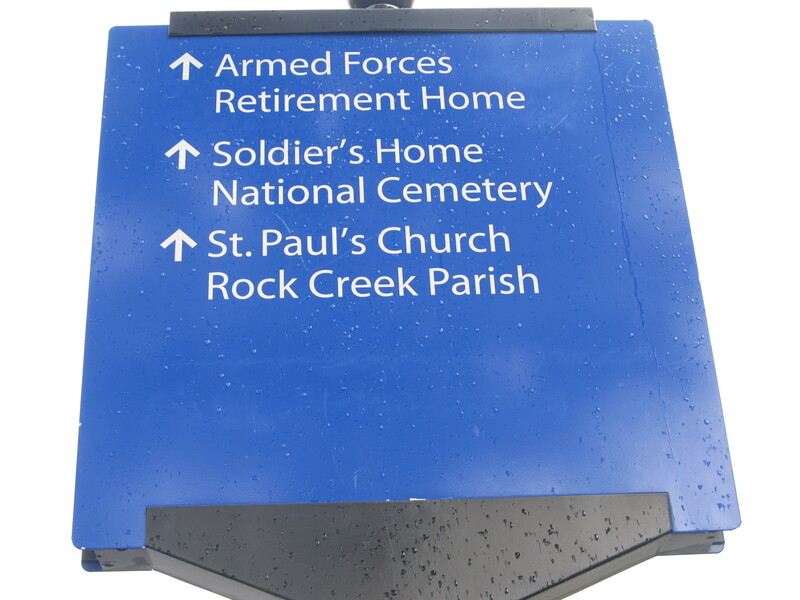 Last Thursday I received an email alerting me that the wayfinding sign on the southeast corner of Rock Creek Church Road and Georgia Avenue had the word Soldiers’ misspelled on both sides as “Solider’s”. I immediately contacted DDOT and the Mayor’s Ward 1 Liaison, Office of Neighborhood Engagement, to determine who the correct person was to take this to. Turns out its DDOT … and I have to say, DDOT acted immediately. 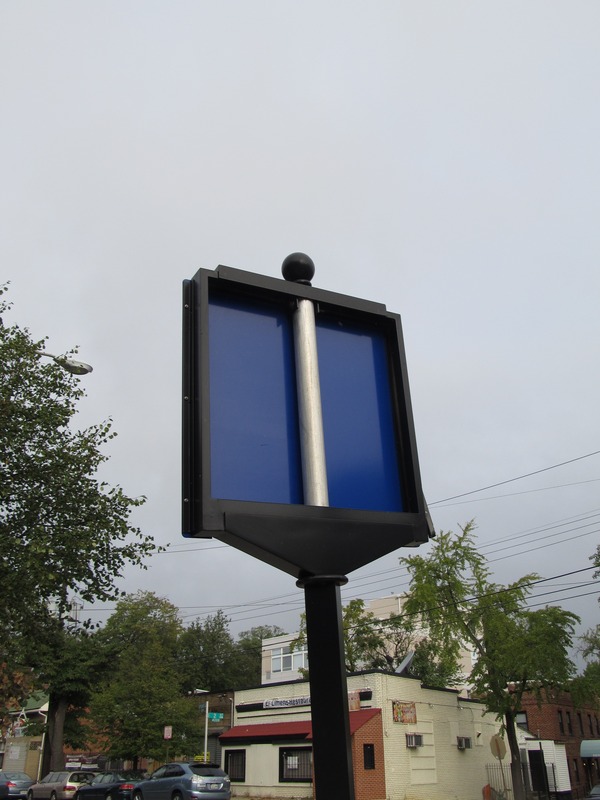 As you can see from the photo above, in one week’s time the signs were examined, removed, and reinstalled with corrected text. The responsiveness of DDOT to this relatively minor issue was incredible, and from my perspective, such attention to feedback from the community definitely leads me to believe that DDOT is one of the better agencies the city has. Here’s something to see how observant most of us are. 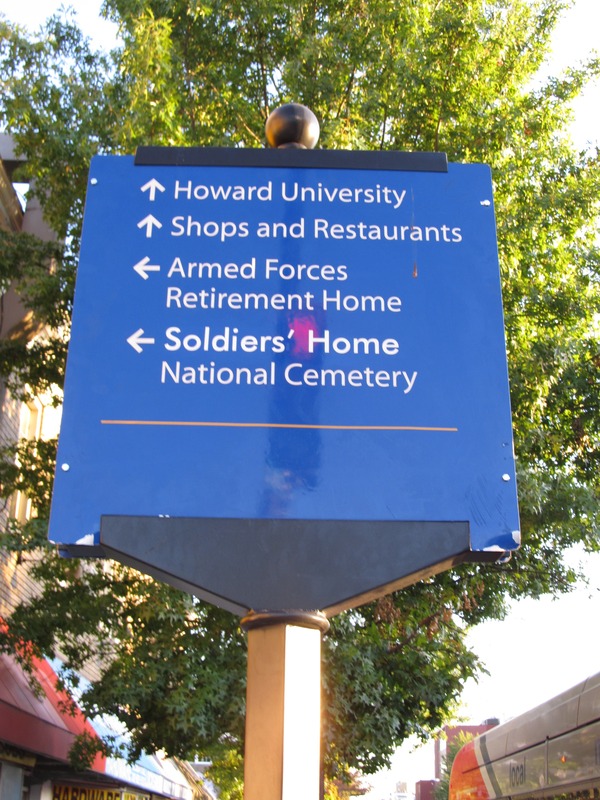 Wayfinding signs, like the one to the right, can be found throughout the city. They are intended to be helpful, especially to those who find themselves looking for something outside of familiar territory. However, it was recently brought to my attention by a resident on Quebec Place (thank you Christine) that they can also be sources of embarrassment. Many of these signs are riddled with typographical errors … some being quite obvious. Most of us probably don’t notice the errors because we look at the signs quickly in passing, but if you actually read the signs you can occasionally catch an error. Here are some recent examples. The sign on Upshur at New Hampshire places the apostrophe before the "S"
The sign pictured above has two errors, one major and one common. If you look closely at the word Soldiers’ you’ll notice that the apostrophe is before the “S” rather than after. I see this a lot when it comes to this word. Another example is on the sign at Upshur and New Hampshire Ave., NW (see above). The major error is with the word “Soldier”. For some reason it is spelled with the “I” before the “D” on both sides of the sign. While I don’t know what circumstances exist that lead to such errors, it does appear that there is hope that we can get them corrected. I’ve contacted DDOT and they indicated that they will send someone out to look at the sign and make a recommendation on how to correct it. I’m not sure what the timeline will be, but I did find one sign of hope from the sign at Upshur and 2nd Street NW. Currently the sign facing the Soldiers’ Home’s Eagle Gate has been removed. This is presumably so that it can be replaced. 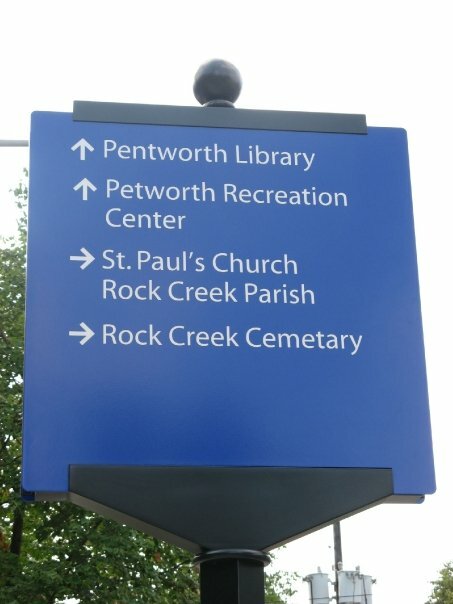 If you look at the photograph below of that sign prior to removal, you can see the typos that needed to be addressed — these being that the neighborhood was spelled as “Pentworth” and cemetery was spelled with an “A”. All of this leads me to wonder if all signs in the area need to be examined. This past weekend I checked out the area from Quebec to Upshur. Next weekend I’ll need to check out the signs to the south. Does anyone know of any signs near them that need to be reported? 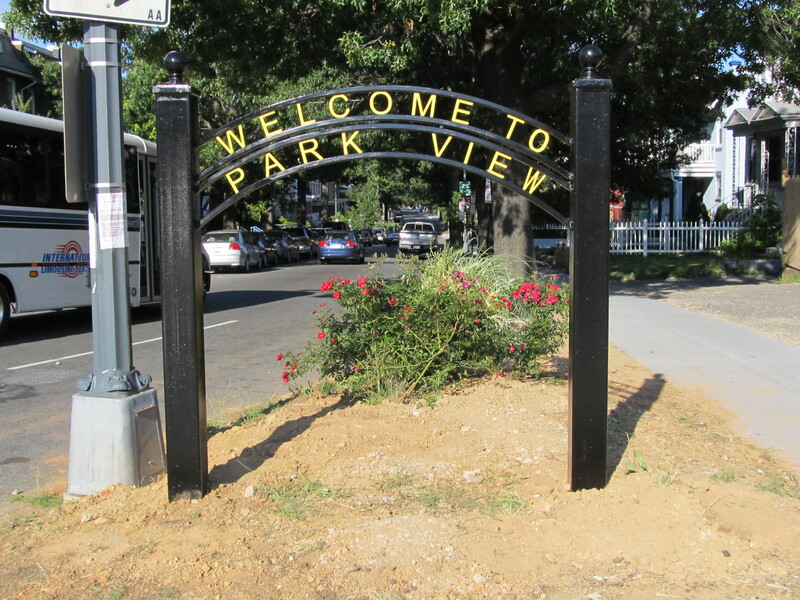 The hard work and dedication of the Irving Street residents appears to have paid off in their efforts to replace the Irving Street gateway sign with a new, wrought-iron version that will say: “Welcome to Park View.” At the September 14, 2011, ANC 1A meeting the Commissioners voted five to three in favor of the their request. 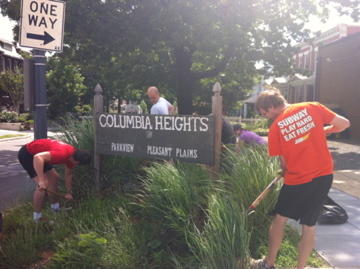 For the past few years, the residents of the 400-600 blocks of Irving Street, NW, have been working hard to beautify and improve their community. They have been getting together to pick up trash on Saturdays and have been working with the City to get graffiti removed. 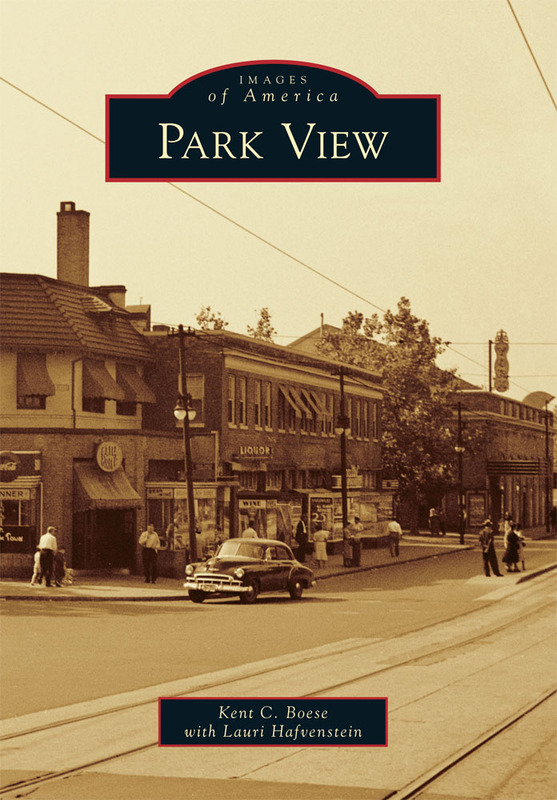 They have even adopted a name, the Park View Beautification Crew. Rain was unable to dampen the spirits of those who volunteered to plant the New Hampshire median between Randolph and Shepherd. 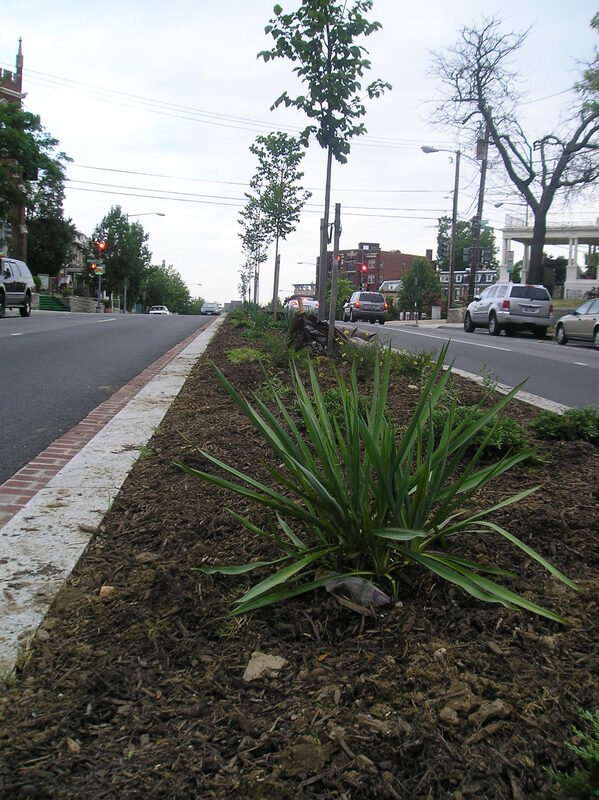 Among the new plants adding beauty to the neighborhood are yucca, Russian sage, creeping juniper, coreopsis, and sedum. These plants were chosen in part because they are drought tolerant. Will CVS Be a Beacon in the Evening? 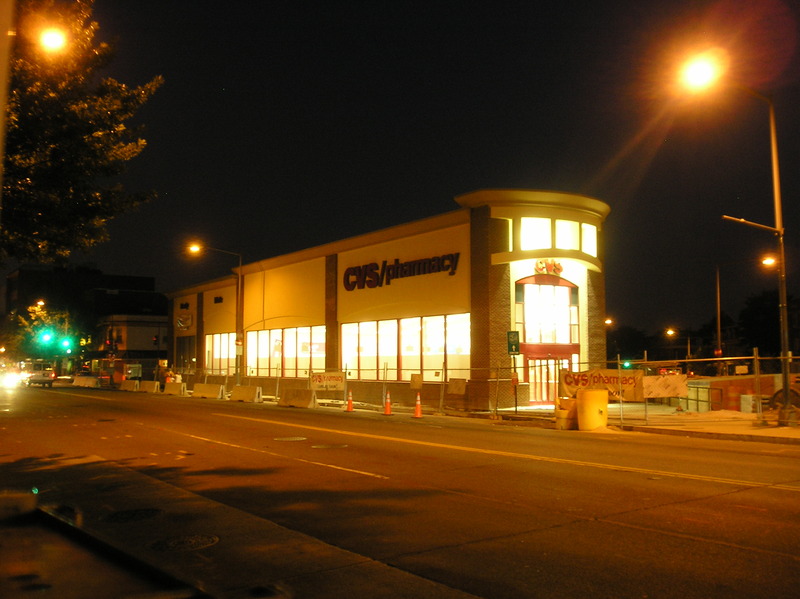 Since November 12, 2009, I’ve been watching the new CVS at Georgia and New Hampshire Avenues rise with interest. Yet it was not until one night last week that I realize that one of the most significant impacts this building will have on the neighborhood will be at night. I hadn’t even considered the possibility of light pollution. As you can see from the photographs here, the major area impacted by the illumination of CVS at night is along Georgia Avenue. The more residential New Hampshire Avenue facade of the building has smaller windows and, as a result, less light bleeding outside of the building. While the definition of light pollution varies a little depending upon where you find it, one definition used by the National Park Service is: Principally, the illumination of the night sky caused by artificial light sources, decreasing the visibility of stars and other natural sky phenomena. Also includes other incidental or obtrusive aspects of outdoor lighting such as glare, trespass into areas not needing lighting, use in areas where or at times when lighting is not needed, and disturbance of the natural nighttime landscape. In using the NPS definition it’s safe to say that there is some light pollution occurring. However, most of the nighttime illumination spilling from the CVS could actually be considered beneficial by some since it will help light the sidewalk area. When all is taken into account, the reality is that this new addition to Georgia Avenue looks as lit up as it is mainly because nothing else around it is lit up at all. The businesses across Georgia Avenue barely cast off any evening light, the retail spaces at the Park Place development are mostly empty with the exception being a restaurant having low lighting, and the Metro station and streets rely on traditional street lighting. Likewise, the buildings directly to the south are also largely dark in the evening. 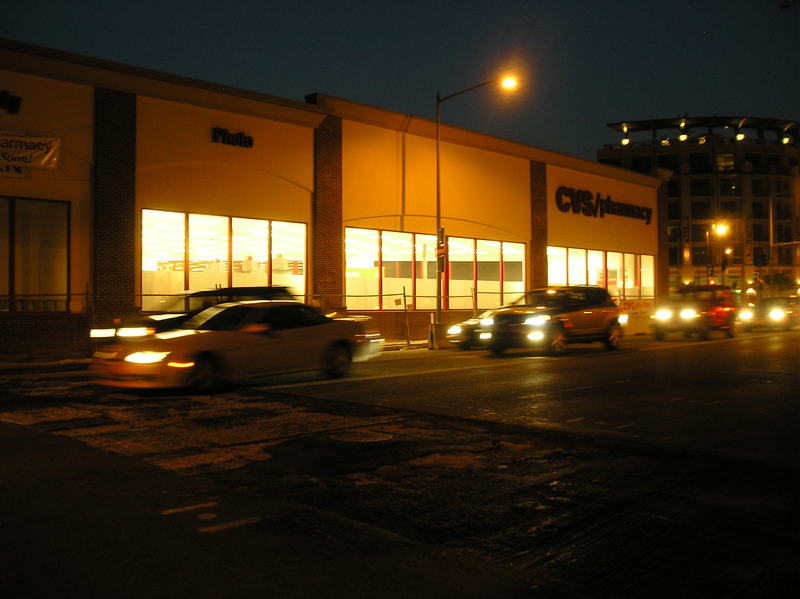 When taking the number and types of businesses surrounding the CVS into account, and factoring in the slow speed of development along Georgia Avenue, it’s a good bet that the closest neighbors CVS will have that rival its luminosity (such as the Safeway at 3830 Georgia) will be a minimum of two blocks away for many years to come.